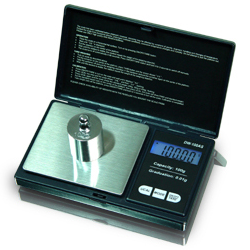 The DigiWeigh DW-600B has a capacity of 600 grams with a readability of 0.1 gram. The DW-B series of pocket scales are a great value for an inexpensive and portable pocket scale. The scale features a flip top cover that protects the scale while not in use and has a stainless steel weighing pan.